Acute and late skin toxicities are an unfortunate but expected side effect of breast cancer treatment with radiation therapy. 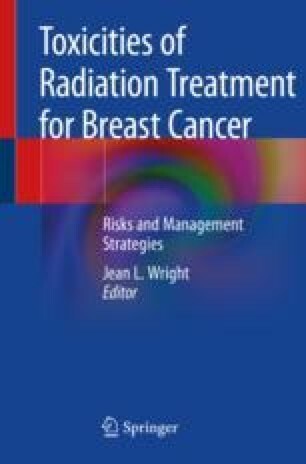 Thoughtful consideration of the normal structure and function of the skin and the anatomy of the breast may facilitate understanding and anticipation of radiation-related skin reactions. Specific acute and late toxicities have been described and are largely evaluated using provider-reported ratings of clinical exam findings. Risks for development of skin toxicity are likely related to both patient- and treatment-specific factors. Most techniques for the management of skin toxicity are experience-based or supported by small, non-randomized studies. Adoption of more detailed assessments of dermal injury following radiotherapy may improve understanding of discrete entities and identify new avenues toward the development of tailored management strategies for specific radiation-related skin toxicities. Chan RJ, Webster J, Chung B, Marquart L, Ahmed M, Garantziotis S. Prevention and treatment of acute radiation-induced skin reactions: a systematic review and meta-analysis of randomized controlled trials. BMC Cancer. 2014; https://doi.org/10.1186/1471-2407-14-53. Chen M, Chen W, Lai C, Hung C, Liu K, Cheng Y. Predictive factors of radiation-induced skin toxicity in breast cancer patients. BMC Cancer. 2010; https://doi.org/10.1186/1471-2407-10-508. De Langhe S, Mulliez T, Veldeman L, Remouchamps V, van Greveling A, Gilsoul M, et al. Factors modifying the risk for developing acute skin toxicity after whole-breast intensity modulated radiotherapy. BMC Cancer. 2014; https://doi.org/10.1186/1471-2407-14-711. Kong M, Hwang DS, Lee JY, Yoon SW. The efficacy and safety of Jaungo, a traditional medicinal ointment, in preventing radiation dermatitis in patients with breast cancer: a prospective, single-blinded, randomized pilot study. Evid Based Complement Alternat Med. 2016; https://doi.org/10.1155/2016/9481413. Kraus-Tiefenbacher U, Sfintizky A, Welzel G, Simeonova A, Sperk E, Siebenlist K, et al. Factors of influence on acute skin toxicity of breast cancer patients treated with standard three-dimensional conformal radiotherapy (3D-CRT) after breast conserving surgery (BCS). Radiat Oncol. 2012; https://doi.org/10.1186/1748-717X-7-217. National Cancer Institute, National Institutes of Health, U.S. Department of Health and Human Services. Common terminology criteria for adverse events (CTCAE) version 5.0. 2017. https://ctep.cancer.gov/protocoldevelopment/electronic_applications/docs/CTCAE_v5_Quick_Reference_5x7.pdf. Accessed 23 Sept 2018. Tieu MT, Graham P, Browne L, Chin YS. The effect of adjuvant postmastectomy radiotherapy bolus technique on local recurrence. Int J Radiat Oncol Biol Phys. 2011; https://doi.org/10.1016/j.ijrobp.2011.01.002. Tortorelli G, Di Murro L, Barbarino R, Cicchetti S, di Cristino D, Falco MD, et al. Standard or hypofractionated radiotherapy in the postoperative treatment of breast cancer: a retrospective analysis of acute skin toxicity and dose inhomogeneities. BMC Cancer. 2013; https://doi.org/10.1186/1471-2407-13-230. Watson LC, Gies D, Thompson E, Thomas B. Randomized control trial: evaluating aluminum-based antiperspirant use, axilla skin toxicity, and reported quality of life in women receiving external beam radiotherapy for treatment of stage 0, I, and II breast cancer. Int J Radiat Oncol Biol Phys. 2012; https://doi.org/10.1016/j.ijrobp.2011.12.006. Yang DS, Lee JA, Yoon WS, Lee NK, Park YJ, Lee S, et al. Comprehensive evaluation of personal, clinical, and radiation dosimetric parameters for acute skin reaction during whole breast radiotherapy. Biomed Res Int. 2016; https://doi.org/10.1155/2016/3656574.